Practice with our SBI PO Prelims reasoning questions 2019 day 9. The Exam pattern for SBI PO has been changing every year. Due to the dynamic changes in exam pattern, the questions become tougher compared to the previous year. So the questions are at a high level than the candidate’s calculation. Depends upon the current situation our IBPS Guide is providing the updated SBI PO prelims reasoning questions 2019 day 9 for SBI PO 2019. Our Skilled experts were composing the questions under the new level of the examination and in aspirant’s exam point of view. So candidates gear up your preparation, practice daily with our SBI PO Prelims reasoning questions 2019 day 9 and implement your skill. With your attentive preparation, we wish you all getting success in your SBI PO 2019. Ten persons A, B, C, D, E, P, Q, R, S and T are sitting in a straight line but not necessary in the same order. Some of them are facing north and some of them are facing south direction. Not more than two successive persons are facing the same direction. Immediate neighbours of R faces opposite direction to R. S faces the same direction of D. E sits third to the right of Q, who sits third from either ends of the line. S is not an immediate neighbour of Q. A sits third to the right of P, who sits one of the extreme ends of the row. P faces same direction as E faces. C faces south and sits second to the left of T. There are two persons sitting between B and R and none of them sits at the extreme ends of the line. S sits second to the right of E. As many persons sits to the right of T is same as the persons sits to the right of B. Immediate neighbours of S faces opposite directions to each other. 1. How many persons are sitting to the left of A? E sits third to the right of Q, who sits third from either ends of the line. S sits second to the right of E.
S is not an immediate neighbour of Q. A sits third to the right of P, who sits one of the extreme ends of the row. P faces same direction as E faces. C faces south and sits second to the left of T.
There are two persons sitting between B and R and none of them sits at the extreme ends of the line. As many persons sits to the right of T is same as the persons sits to the right of B. Immediate neighbours of S faces opposite directions to each other. Immediate neighbours of R faces opposite direction to R.
S faces the same direction of D.
2. Who among the following sits fifth to the right of S? 4. If E is related to S and R is related to Q in a certain way. Then, A is related to which of the following? 5. Which of the following pairs sitting at the extreme ends of the row? 6. Who among the following is the lightest? 7. If K is 68 kg, then what is the possible weight of M? 8. If X is exactly lies between J and K. Then what will be the position of X? Arun starts walking towards north for 5 km to reach point A. From there he took a right turn and walks for 8 km to reach point B. After that he took a right and walks for 12 km to reach point C, which is 4 km to the west of point D. From point D, Arun walking towards north for 7 km to reach point E. Finally he took a left turn and walks for 8 km to reach point F.
9. What is the direction of point A with respect to the point F? 10. What is the shortest distance between point A and point E? 1) How many persons are sitting to the left of A? 2) Who among the following sits fifth to the right of S? 4) If E is related to S and R is related to Q in a certain way. Then, A is related to which of the following? 5) Which of the following pairs sitting at the extreme ends of the row? 6) Who among the following is the lightest? 7) If K is 68 kg, then what is the possible weight of M? 8) If X is exactly lies between J and K. Then what will be the position of X? 9) What is the direction of point A with respect to the point F? 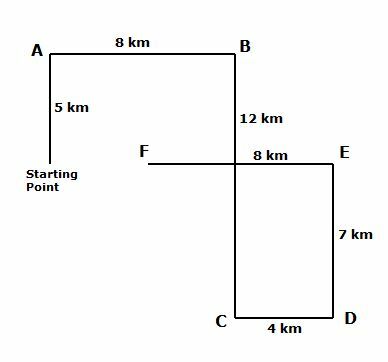 10) What is the shortest distance between point A and point E?